A comprehensive listing of the top 50 law firms ranked by the total cash amount of final North American securities class action settlements occurring in 2017. Plaintiffs’ firms qualifying for inclusion in the analysis are those serving in the role of lead or co-lead counsel. For calendar 2017, ISS Securities Class Action Services LLC (“SCAS”) recorded 162 approved securities class action settlements within North America. Collectively, 2017 delivered $2.1 billion in settlement funds for distribution, a marked decrease from the $7 billion recovered in 2016 and the lowest yearly total since the early 2000’s. However, new cases filed in 2017 were significantly higher than the previous year. Underscoring the year-over-year ebb and flow in the value of North American class action settlements, a sizeable $3.5 billion in settlement funds has thus far been announced in 2018. 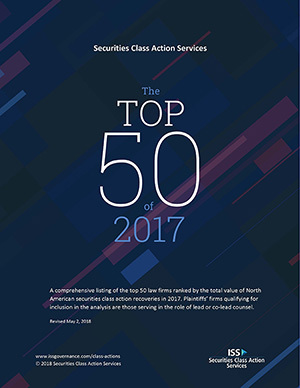 In fact, one U.S. settlement announced in early 2018, Petrobras, ranks among the top five securities class action recoveries of all time.